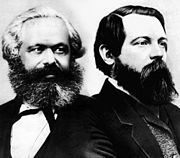 One of the chief concerns of Marxist aesthetics is to unite Marx and Engels’ social and economic theory, or theory of the social base, to the domain of art and culture, the superstructure. These two terms, base and superstructure, became an important dichotomy in The German Ideology (1846), which however was not published during their lifetimes. Likewise Marx's early Economic and Philosophical Manuscripts of 1844, which, though widely regarded as important for treating the themes of sensuousness and alienation, first appeared only in 1932 (the slated 1846 publication was canceled) and in English only in 1959. The manuscripts were therefore unknown to art theorists during, for instance, the often antagonistic debates on art in the early Soviet Union between the constructivist avant garde and the proponents of socialist realism. The controversy over the unusual design of the original documents adds another twist. Many theorists touch upon important themes of Marxist aesthetics without strictly being Marxist aestheticians, Joel Kovel, for instance, has extended the concepts of Marxian ecology which deeply implicates aesthetics. He is also a part of the struggle to bridge the space between Marx and Freud, which has Marxist aesthetics as a central concern. Current themes within the field include research on the effect of mass-produced industrial materials on the sensed environment, such as paints and colors. A strong current within the field involves linguistics and semiotics, and arguments over structuralism and post-structuralism, modernism and post-modernism, as well as feminist theory. ^ Tedman, Gary. (2004) "Marx's 1844 manuscripts as a work of art: A hypertextual reinterpretation." Rethinking Marxism 16.4: 427-441. ^ Fay, Margaret, "The Influence of Adam Smith on Marx's Theory of Alienation", Science & Society Vol. 47, No. 2 (Summer, 1983), pp. 129-151, S&S Quarterly, Inc.
^ Gary Tedman (2007). "Economic & Philosophical Manuscripts of 1844 (as hypertext) by Karl Marx". Retrieved 2016-02-08. ^ See notes, Margaret Fay, Gary Tedman. ^ See the journal Capitalism, Nature, Socialism. ^ Singh, Iona. (2007) "Color, Facture, Art and Design." Capitalism Nature Socialism 18.1: 64-80. Understanding Brecht, Walter Benjamin, Verso Books, 2003, ISBN 978-1859844182. Aesthetics and Politics: Debates Between Bloch, Lukacs, Brecht, Benjamin, Adorno. 1980. Trans. ed. Ronald Taylor. London: Verso. ISBN 0-86091-722-3. Adorno, Theodor W. 2004. Aesthetic Theory. London: Continuum. ISBN 0-8264-7691-0. Eagleton, Terry. 1990. The Ideology of the Aesthetic. Oxford and Malden, MA: Blackwell. ISBN 0-631-16302-6. Marcuse, Herbert. 1978. The Aesthetic Dimension: Toward a Critique of Marxist Aesthetics. Trans. Herbert Marcuse and Erica Sherover. Boston: Beacon Press. Singh, Iona. 2012 "Color, Facture, Art and Design", Zero Books. ISBN 978-1-78099-629-5. Tedman, Gary. 2012. Aesthetics & Alienation, Zero Books. ISBN 978-1780993010. Rose, Margaret A. 1988. Marx's Lost Aesthetic: Karl Marx and the Visual Arts. Cambridge: Cambridge University Press. ISBN 978-0521369794. This page was last edited on 19 September 2018, at 17:34 (UTC).